The MM04C is a point to point or point to multipoint audio codec using IP-based audio network technologies for real-time streaming. Based on the know-how of MM01 and MM08E and customer requirements the MM04C offers you a variety of features and opportunities to ease your daily work. 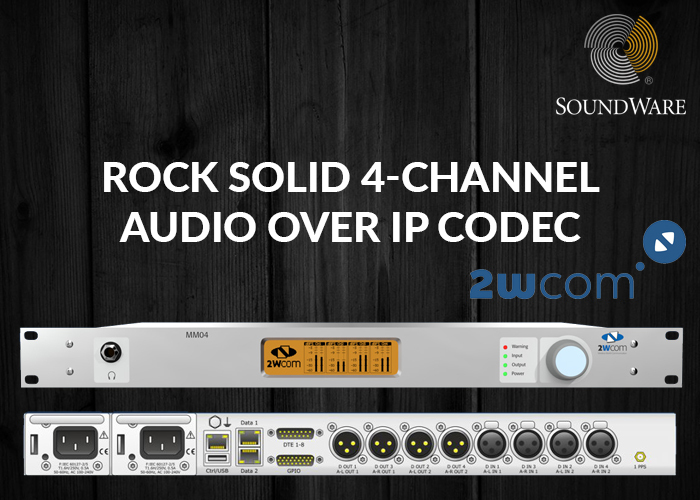 Flexible in application: The codec is designed for studio-to-studio, studio-to-transmitter links and cross-media tasks. Even synchronization with microsecond accuracy is possible by an implemented latency control (useful for simultaneous signal output of all decoders of a network or for audio description). In addition, audio streams can be combined to multichannel streams. An optionally available FM Tuner offers further functions for fallback or backup and rebroadcasting. The Easy2connect feature provides operators as well as reporters with an easy to use connection establishment (SIP phonebook) while being in the field. High compatibility: MM04C support a wide range of protocols for streaming, control and monitoring (e.g. EBU TECH 3326, AES67, Ravenna, Livewire+, Dante, SMPTE ST 2110, PTPv2, RTSP, SAP, SIP, Discovery, Bonjour, SNMP, HTTP, HTTPS, FTP, FTPS or Ember+ and more). Furthermore, the exchange of additional information like GPIO and ancillary data between the audio networks is possible. Pay as you grow: All soft- and hardware components are individually combinable. The scalability from one to four audio channels using software licenses gives you flexibility in planning your network and reducing your costs. Multi-format audio coding: Another advantage is the variety of possible algorithms like MPEG1 Layer 2, MPEG2 Layer 3, most AAC profiles including the new xHE-AAC and AAC-ELDv2, OPUS, Ogg Vorbis, PCM, Enhanced aptX, Dolby Digital plus (on request) and more. Transmission robustness: Dual Streaming and Pro-MPEG FEC ensure rock-solid IP transmission or you go beyond with Stream4Sure (the decoder is able to switch seamlessly in between up to 4 streams with different audio qualities forwarded by the encoder).The Reliable User Datagram Protocol (RUDP) ensures highest packet recovery with minimum bandwidth and low latency. Two hot pluggable power supplies guaranteeing fail-safe operation perfect the whole concept. Smart management: Configuration set-up via an easy to use web interface for general settings as well as for backup or fall back. For remote control, the codec offers various possibilities – HTTP, FTP, Telnet, NMS, SNMP. Perfect synchronization can be achieved by PTPv2 and latency control.